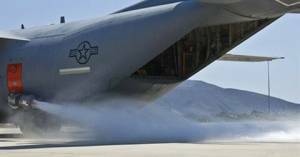 Nevada City, CA April 19, 2018 – From April 22 through April 27, visitors to the Tahoe National Forest near Nevada City may see a large, low-flying, military C-130 aircraft performing water drops. But this isn’t an early-season wildfire – it’s a Modular Airborne Fire Fighting System (MAFFS) training flight. MAFFS are portable fire retardant delivery systems that can be inserted into military C-130 aircraft to convert them into firefighting air-tankers when needed. These systems are capable of dropping up to 3,000 gallons of fire retardant in six seconds. The system slides into the back of the aircraft and retardant is released through a nozzle on the rear left side. The MAFFS program is a joint effort between the US Forest Service and the Department of Defense (DoD). The Forest Service owns the MAFFS equipment and supplies the retardant, while the DoD provides the C-130 aircraft, flight crews, maintenance, and support personnel to fly firefighting missions. Since the program was created in the 1970s, the role of MAFFS has been to provide a “surge” capability that can be used to boost wildfire suppression efforts when commercial air-tankers are fully committed or not readily available. During this training week, personnel from military units and wildland firefighting agencies across the U.S. are convening in McClellen Air Park in Sacramento. Scheduled overflights will occur on both the Shasta-Trinity National Forest and the Tahoe National Forest. During these training overflights, water will be dropped to simulate retardant and only in pre-selected locations.